6/16 Cup of Coffee: It was a busy Father's Day down on the farm, with several good pitching performances throughout the system. Felix Doubront took a big step in his rehab, Brian Johnson (pictured) was tremendous again, and Jake Drehoff impressed in his Lowell debut. The PawSox lost the lead with two outs in the top of the ninth, dropping a heartbreaker to the Charlotte Knights (CWS), 2-1. Felix Doubront pitched well, throwing five hitless innings, while walking four and striking out 10. He was stretched out to 93 pitches, and threw 50 for strikes. Matt Barnes came out of the bullpen, keeping the Knights off the board in his three innings of work, allowing three hits while striking out two. Drake Britton came on in the ninth with the PawSox up 1-0, and with a runner on first and two outs, he served up a two-run home run to give the Knights the lead. It was his third blown save of the season, and he picked up his second loss. The Pawtucket offense managed only two hits on the day, with Mike McCoy and Garin Cecchini each notching singles. 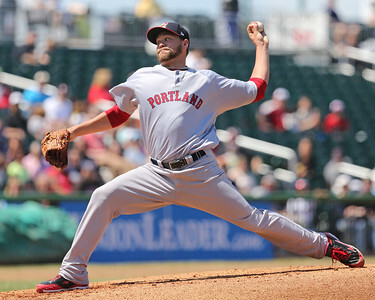 Brian Johnson was fantastic again, leading the Sea Dogs to an 8-0 win over the Akron RubberDucks (CLE). Johnson pitched six innings of shutout ball, surrendering four hits and one walk while striking out five. The left-hander now has a 1.71 ERA with the Sea Dogs, and he has allowed no more than two runs in any of his eight starts. Michael Olmsted, Matty Ott, and Aaron Kurcz combined to finish off the shutout, tossing one scoreless inning each. Offensively, Portland was powered by Keury De La Cruz and Sean Coyle. De La Cruz slugged two home runs and drove in three runs, while Coyle connected for a three-run home run, and his 2 for 4 day raised his average to .348. Blake Swihart had another strong day at the plate, going 1 for 3 with a double and two walks, and Heiker Meneses went 2 for 4 with a stolen base. Salem scored four unanswered runs, and walked off with a 6-5 victory over the Lynchburg Hillcats (ATL). Cody Kukuk got the start, and struggled mightily with his control, walking seven and allowing four runs in 1 2/3 innings. Kukuk, 21, is now walking almost a batter per inning in his eight starts with Salem. William Cuevas pitched well out of the bullpen, allowing one run in 3 1/3 innings, and Nate Reed shut the Hillcats down over the final four innings to keep Salem within striking distance. Down 5-2 in the seventh, Mike Miller hit an RBI single to inch the score closer, and an Aneury Tavarez double and a Kevin Mager sacrifice fly tied the game in the eighth. After Salem hit three singles to load the bases with one out, Ryan Dent smacked a single to left field to end it. Tavarez was the star of the game, going 3 for 4 with a double, a home run, and a walk, and Carson Blair went 3 for 4 with a walk. A promising start for Trey Ball went south, and the Hagerstown Suns (WAS) beat the Drive, 8-5. Ball allowed only one run through five innings, but tired in the sixth, allowing a double, triple, and a home run to push his final line up to four runs in 5 1/3 innings. He gave up eight hits, but walked only one and struck out four. Jantzen Witte hit his eighth home run, and Zach Kapstein went 2 for 4 with a double, but it was not enough to keep pace with the Suns. Jake Drehoff was excellent in his 2014 debut, but the Spinners fell to the Vermont Lake Monsters (OAK), 6-4. Drehoff went the first five innings, allowing two runs, one earned, while striking out six without walking a batter. The Lake Monsters broke through against the bullpen, getting to Edwar Garcia for one run and German Taveras for three runs. Jordan Betts made his one hit count, hitting a solo home run in the fourth. Bryan Hudson, Nick Longhi, and Alixon Suarez all had two hits, with Longhi adding a double and Suarez adding a triple. Longhi is now 5 for 12 over his first three games. Player of the Day: Brian Johnson continued his great 2014 campaign with six shutout innings, and improved his record to 8-2 on the season between Salem and Portland. He now has 73 strikeouts in 73 innings between the two levels, with a WHIP barely over 1.00. The former first-round pick has combined with Henry Owens to be a dominating top of the rotation for the Sea Dogs, which is one of the main reasons why the team is 44-23 and has allowed the fewest runs in the Eastern League.